Tuesday, 1 January 2019, 11:27a.m. Kim Jong Un will be keeping North Korea watchers busy on New Year's Day, when he is expected to give his annual address laying out the country's top priorities for the year ahead. The speech, which is normally broadcast on North Korea's state-run television network, is often the best gauge of what the North Korean leadership is focused on and what tone it will take in its dealings with the outside world. For 2019, it will be parsed carefully for clues about Kim's thinking on denuclearisation talks with Washington and a second summit with US President Donald Trump, relations with South Korea and Pyongyang's efforts to get out from under international sanctions as it tries to build up its domestic economy. This is Kim's primary concern. He made that clear in his 2018 News Year's address and his government has been hammering it home ever since. In his first televised speech, at a military parade in 2012, Kim vowed the nation would never again have to tighten its belts, a reference to the economic hardships it has faced, including a disastrous famine in the 1990s. While they remain isolated and unable to travel or experience foreign media freely, North Koreans are aware of the yawning prosperity gap between themselves, South Korea and China. Kim has tried to address that by initiating infrastructure projects in major cities, building up the capital and allowing — if not overtly supporting — the spread of the market economy. What's not clear is how far he is willing to go with the kind of fundamental, systemic reforms needed to really ensure sustainable growth. North Korea has hinted it wants to join the World Trade Organisation and be more a part of the global economic community. But that would also require some risky moves — like increased transparency and commitment to global rules and norms. A big question is how much control Kim is willing to relinquish in exchange for prosperity. North Korea is entering the fourth year of a five-year economic plan that Kim announced with great fanfare at a rare congress of his ruling party in 2016. If precedent is any indication, he will go into some detail outlining, sector by sector, the country's successes so far and emphasising what remains to be done. This part of the speech is usually couched in deliberately vague, broad or aspirational language and is directed at the domestic party leadership. But if Kim is serious about change, this could be where he drops some important hints. North Korean leader Kim Jong Un, left, and US President Donald Trump shake hands prior to their June meeting on Sentosa Island in Singapore. North Korea is still standing firmly behind the agreements it made with Trump at the Singapore summit. The problem is that North Korea's interpretation of what they agreed to is at odds with that of the Trump Administration. Kim never agreed to unilaterally throw away his hard-won nuclear arsenal, which he maintains is a necessary deterrent to the threat of an attack by the United States. The North's moratorium on nuclear tests and long-range missile launches also isn't part of the summit agreement and there is no explicit promise in the Singapore joint statement that the North won't continue producing or developing its missiles. So while the missiles have stopped flying for now, there's still a lot up in the air. Kim agreed the North would "work towards the complete denuclearisation of the Korean Peninsula". But from the North's perspective, it must include the removal of what it has always claimed is the reason why it has nukes in the first place — the threat of a US nuclear attack. While not directly criticising Trump, a tactic it is likely to stick with until it sees the overall process as seriously off the rails, the North has tried to play him against his advisers while it pushes for security guarantees and sanctions relief. The bottom line is that North Korea hasn't given up much since Singapore. And it doesn't think Washington has, either. Trump has said a second summit could be held soon. The New Year's speech gives Kim a golden opportunity to set the goalposts and to try to further detach Trump from his advisers. 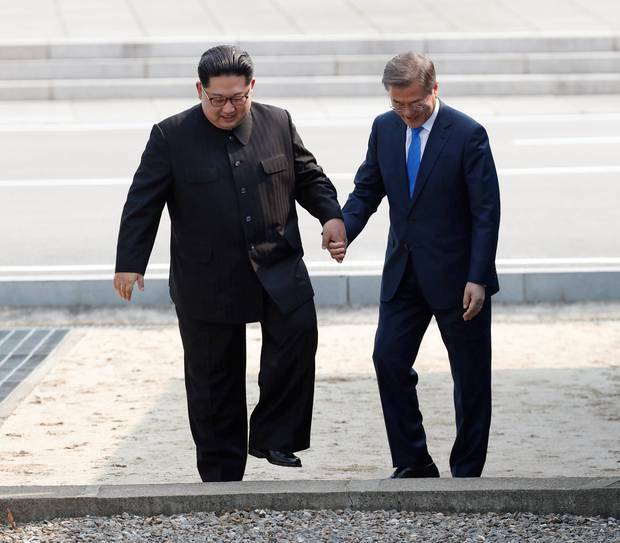 North Korean leader Kim Jong Un, left, and South Korean President Moon Jae In cross the border line at the border village of Panmunjom in Demilitarised Zone in April. In contrast to Pyongyang's dealings with Washington, relations between North and South Korea have seen a major thaw. With three leaders' summits in 2018 and dozens of other meetings, the Koreas have opened a liaison office in the North Korean border town of Kaesong, created border buffers and no-fly zones to reduce military tensions, and jointly surveyed North Korea's outdated railways and roads with the goal of connecting them with the South. They even vowed to make a bid to jointly host the 2032 Summer Olympics. But Seoul cannot proceed without the removal of US-led international sanctions. While President Moon Jae In sees inter-Korean reconciliation as a crucial part of nuclear diplomacy, his enthusiasm for engagement has caused discomfort in Washington. Pyongyang, meanwhile, has already begun expressing its frustration with the slowdown in inter-Korean projects and demanded that Seoul break from Washington's lead. 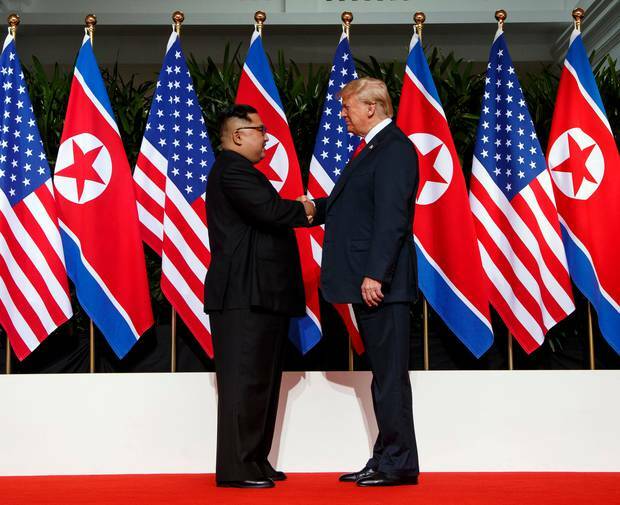 Some analysts expect Kim to further try to drive a wedge between the allies with a nationalistic call for stronger inter-Korean cooperation, while painting Washington as a bad-faith actor refusing to take corresponding measures to the North's unilateral dismantlement of a nuclear test site and the suspension of nuclear and long-range missile tests.